So it's been a very long time since I talked about Deerhunter, at least on this channel in a formal review - I discussed Monomania in the very early days of my channel, but when it came to Fading Frontier in 2015, I actually teamed up with the Indieheads podcast to discuss the album at length... and yet somehow I wound up as the guy who was the stick in the mud who didn't really care much for the album. And what's frustrating is that whenever I've listened to a Deerhunter album in recent years, I've come away with the understanding of exactly why a lot of critics adore this band... and yet it never clicks as well as so many of their peers. Don't get me wrong, there are projects in their back catalog I enjoy, but I struggle to put any of their albums on a pedestal in any respective year - Halcyon Digest might get close, but even then it's dicey. And what's exasperating is that it's never just been one thing: the most consistent frustration probably comes with frontman Bradford Cox's improvised song construction and persistently underwhelming nihilism, but when you factor in distinct production and tonal inconsistencies, it leaves me never quite liking or disliking a Deerhunter album in the same way. And coming off of Fading Frontier... look, it's not bad, but revisiting it highlights a lot of repeated lyrical issues from earlier albums and the more placid tone and instrumentation continues to show how that brand of mid-to-late-80s Americana has been done better elsewhere by a lot of acts in recent years. That said, I was curious about this new project, as buzz was suggesting more elaborate instrumentation could make this Deerhunter's answer to The National's High Violet - a comparison of which I was immediately skeptical because say what you will about that band, Matt Berninger can write cohesive songs and outside of their last album has consistently great production. But fine, I can appreciate more ambition, so what did we get from Why Hasn't Everything Already Disappeared? Well, first off, any serious music critic who said this album in the same sentence as The National should have their faculties checked, because High Violet was about the last comparison that came to my mind. No, upon the first six or seven listens to Why Hasn't Everything Already Disappeared?, my mind went to 'what if Real Estate tried to be British and steal all of MGMT's new synthesizers', or 'what if someone had taken a Sufjan Stevens album and replaced earnest contemplation with sloppy blending and played-out nihilism'. As of yet I'm not sure I can precisely call it Deerhunter's worst album, but it is absolutely the band at their most pretentious and least tolerable. At best it's stiff and surprisingly indulgent for its brevity, whereas at worst... look, I've been running with the suspicion that Bradford Cox has been pulling a long con on how much music critics will tolerate, and he's damn close to the breaking point with me. In fact, let's start with Cox's stream of consciousness, shall we, which is the first pass that a lot of critics have afforded Deerhunter because the poetry seems to coalesce and there's more thematic coherence than even some less ambitious projects. But over the past few projects I've had the suspicion that's because Cox has hit the same depressive, pseudo-nihilistic notes time and time again, and going through this project, it's hard to see much is all that different beyond an awareness that a chunk of the rest of the world has caught up with him. And man, you can tell he's going to gloat about it too - never directly, as Cox's delivery seems to mostly stick with a strained but not particularly dynamic tone - but as early as 'Death In Midsummer' he's telling the audience to humble themselves, because everything is dying, has always been dying and fading away, and what are you going to do about it? But what gets weird is that you get the impression that now that we're all on that page, Cox doesn't really know where to take things, leading to the utterly jarring and tone-deaf 'tribute' to the assassinated UK politician Jo Cox on 'No One's Sleeping', the flailing gestures to elemental forces on, well, 'Element', and the utterly noxious jabs at current technology and social media on 'Futurism', where the implication is that people find comfort in it thanks to fear... and yet he seems to lack the awareness that many people abandon reason for faith as he does on the third verse for much of the same reason. But what's more ugly is the framing of all this: not quite hectoring or snide but with a shade of brighter earnestness that can't help but feel more smug than it should, especially in how 'No One's Sleeping' feels so much like a 'come into the light' moment. Now to be fair, you do get the sense that Cox might be somewhat self-aware of this, and there is an arc to this project, with 'What Happens To People?' showing the rusted away hypochondria of someone who refuses connection and later 'Plains' and 'Nocturne' showing the real possibility of Bradford Cox himself being left behind when people keep on moving and he starts fading. And you know, that's a thematic interpretation I might be able to buy... if I felt it built to anything all that substantive. This is where structure comes in, because despite its short running time this album is in no hurry to coalesce, throwing a perfunctory instrumental interlude three songs in with 'Greenpoint Gothic' and then using 'Detournement' a few tracks later as a pitched down, meandering tract where the title implies an inversion of the narrative, turning one's tactics against oneself, but the song itself is too diffuse to deliver beyond a reference. And it's indicative of the larger approach to the album: a base amount of cleverness and foresight to get to a point, but not enough to make it build to more, despite being pleased as punch they got there. Take the social media observations on 'Futurism' - there's nothing profound or original there, Toro y Moi made many of the same on Outer Space, but that project didn't try to take an unconvincing and increasingly ungrounded stance on it. Coupled with how abortive and scattered the lyrics can feel... look, none of this is all that new, my patience is just running thinner. 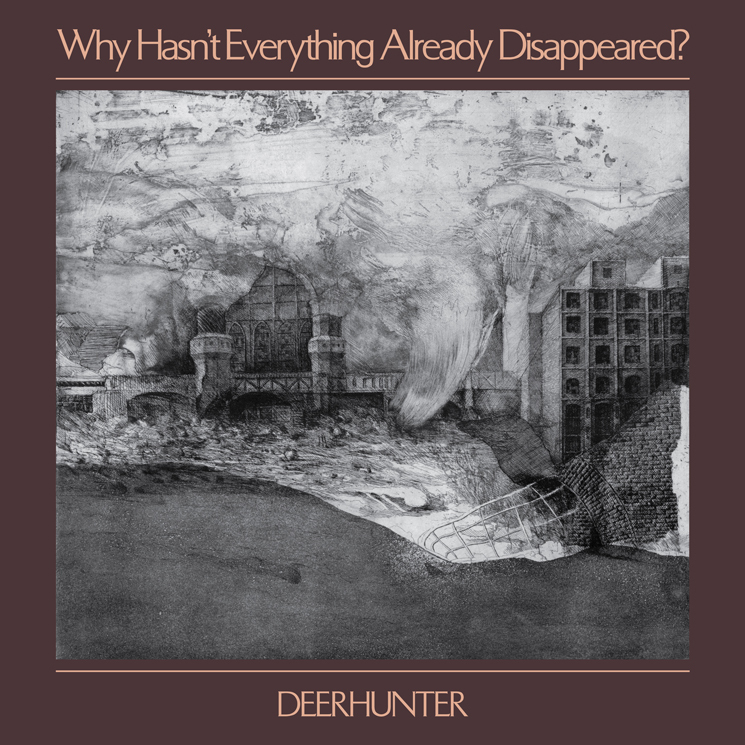 And the biggest factor to that comes in the production and instrumentation, where despite feeling like a pretty brief listen, Deerhunter managed to turn in one of their stiffest, clunkiest project to date - which is saying something considering how much of the inorganic percussion they had on Fading Frontier! But that's what happens when you pitch electric guitar lines out of the window for harpischords, mandolins, and rickety acoustic pickups, and then choose to mic all the drums to sound blocky, overblown and clipped. And then there are the synthesizers, be they the ugly keening on 'Greenpoint Gothic' to the thicker, cleaner wells that can't blend with the pitch-shifted vocals on 'Detournement', from the gummy accent tones across 'Death In Midsummer' and the bizarrely uptempo 'Plains' with the textured percussion that sounds imported from a modern David Byrne project, all the way to the tepid sputter of 'Nocturne' where even the vocals sound like they're malfunctioning - yes, I get that was the point, it doesn't make it better! Factor in the arranged horns and strings, a healthy dose of reverb where there's no consistency where and when it's applied, and a pile-up of clashing fidelities and you have an album trying to sound elegant and stately but with none of the consistent body and polish to get there. And what's all the more exasperating is that Deerhunter can still assemble good melodies and if they had been better layered with more consistent tone, some of these songs could be salvaged. The instrumental doesn't match the content on 'No One's Sleeping', but the back half of the song manages to coalesce to a good melodic groove, and I do think there's a glittering prettiness to both 'What Happens To People?' and 'Plains' that reflect production with more polish and control, even if the latter song feels way too short. Hell, 'Tarmung' brings chimes, what sounds like a marimba, and a pretty solid arrangement in the low end, but it feels hollow, lacking the body to really add to more. So as a whole... look, I know I'll be an outlier in this one, because this is the sort of project that mainstream critics love to praise for its connection to the zeitgeist in the content and its prettier fragments and even its presumed callbacks to other critically acclaimed acts in indie rock. But nearly all of those acts have done these sounds better, and I think it's very telling that the arc of this album leaves the band sputtering in the past as people drift away from their nihilism - I'd say there's poetic irony to it if they didn't all have a justifiable reason to leave, because nobody likes to hear 'I told you so' if there's no follow-through to build anew. In other words, if you can't tell I didn't like this album much at all across the board, which is why I'm giving it a strong 4/10 and not much of a recommendation! Again, if you're Deerhunter fans... you've probably found something within this group I just won't at this point, but even you probably can acknowledge this is a far step from their best. Everyone else... yeah, this band is long past their prime, I'd keep moving on.